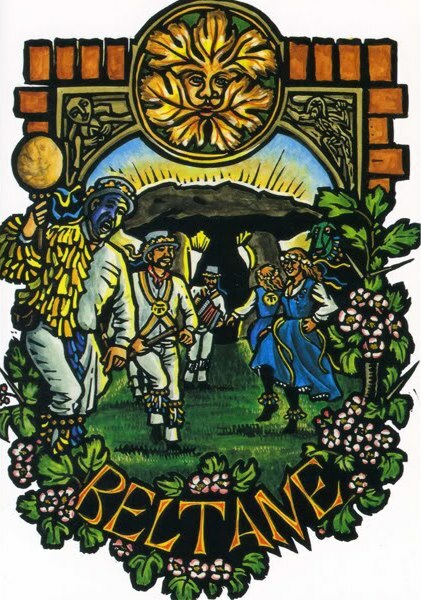 BELTANE, (say Bell-Tane, or Beal-Tine) a Celtic Fire Festival literally meaning “Bright Fire” and refers to ritual extinguishing and rekindling of all fires. Fire means warmth, life, transformation. The Sun God comes to the Earth Goddess signaling good fortune and change. It is the first day of Summer and celebrates the half of the year dedicated to growth and fertility as manifested by the sac red union of the God and Goddess. In this Sacred Marriage of the Goddess, as the land, with the young God as the force of life, the earth bursts forth with sprouting green and the tender colorful blossoms celebrating the fulfillment of their passion, calling us all to participate in their gladness. This is a celebration of life above all! Significant symbols include the bonfire as represented by a candle lit ritual using red candles, maypole with ribbons, and the hawthorn.